Scuttle: A Little Bit of Fashion & Alot of Sparkle: Dylan. Every gal needs a go-to, carry-all tote & this is mine. 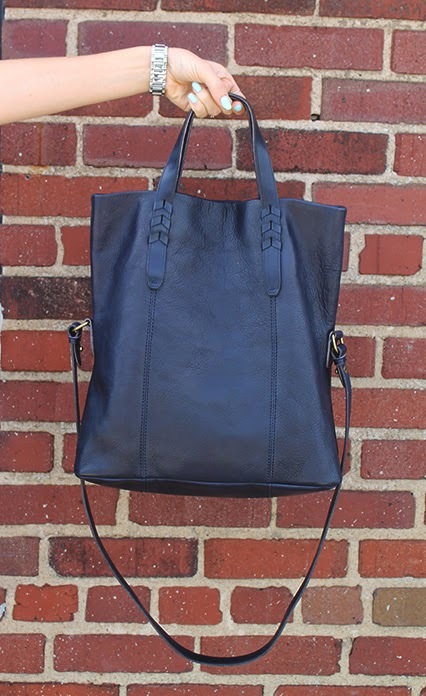 Meet Dylan, my gorgeous navy, leather tote from Madewell (that is currently on sale). I love this one because the color is gorgeous, it has two size handles, it has the right amount of inside pockets & it folds over if you don't have anything tall in it. Its so many things I love in one!! I highly recommend this tote. Madewell has some other great options that don't fold over or that are a bit wider too. I am in love. I'd totally buy this from you.